Veterinarians must make a significant educational and financial commitment to become board certified in one of the many specialty areas of the profession. Certification as a veterinary specialist generally requires an additional two to three years of study plus passing an intensive exam. A specialty residency also must be completed under the supervision of a board-certified specialist in the field. Currently recognized board certifications include many areas such as anesthesiology, behavior, clinical pharmacology, dermatology, emergency and critical care, internal medicine, lab animal medicine, microbiology, nutrition, ophthalmology, pathology, radiology, surgery, theriogenology, toxicology, zoological medicine, and a number of species-specific options (poultry, equine, cattle, etc). The American Veterinary Medical Association’s 2011 Report on Veterinary Compensation included a comprehensive survey of the professional income earned by veterinary specialists. The specialties with the highest median incomes were ophthalmology ($199,000), lab animal medicine ($169,000), pathology ($157,000), surgery ($133,000), internal medicine ($127,000), radiology ($121,000), and theriogenology ($121,000). In comparison, veterinarians without board certification earned a median income of $91,000 per year. The financial rewards for veterinary specialists in the 90th percentile proved even more impressive in the survey. Top ophthalmologists and radiologists could earn more than $345,468 per year. Top pathologists could earn more than $267,000 per year. Top surgeons could earn more than $250,061 per year, and top lab animal medicine specialists could earn more than $246,000 per year. In comparison, top veterinarians without board certification earned $187,000. Board certification also made a big difference in professional earnings for veterinarians working in private practice and public/corporate employment. The median income of private practice veterinarians without board certification was $91,000 per year, while those with board certification had a median income of $157,000 per year. The median income of public/corporate veterinarians (in academia, government, armed services, or industry) without board certification was also $91,000 per year, while those with board certification earned a median income of $133,000 per year. 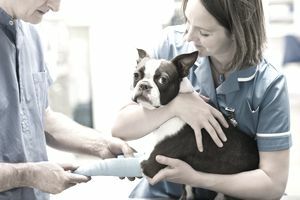 When focusing exclusively on the earnings of veterinarians in private practice, the AVMA survey noted stronger earnings for board-certified veterinarians across all categories. Food animal exclusive veterinarians without board certification earned a median salary of $103,000 per year, while board-certified veterinarians in this type of practice earned a median salary of $187,000 per year. Companion animal exclusive veterinarians without board certification earned a median salary of $91,000 per year, while board certified practitioners earned a median salary of $160,000 per year. Equine veterinarians without board certification earned a median salary of $79,000 per year, while those with board certification earned a median salary of $148,000 per year. This trend continued when focusing exclusively on the earnings of veterinarians in public/corporate employment, with board-certified veterinarians earning higher salaries in all categories surveyed. Veterinarians working in academia earned a median salary of $73,000 per year, while those with board certification earned a median salary of $127,000 per year. Veterinarians working for the federal government earned a median salary of $103,000 per year, while those with board certification earned a median salary of $124,000 per year. Veterinarians working in uniformed services earned a median salary of $85,000 per year, while those with board certification earned a median salary of $91,000 per year. Veterinarians working in this industry earned a median salary of $133,000 per year, while those with board certification earned a median salary of $181,000. Achieving board certification is a significant undertaking for any veterinarian, though the financial rewards can certainly be quite significant. Board certified veterinarians consistently earned much higher salaries when compared to veterinarians holding just the basic DVM degree. The difference in salary between DVM only and board-certified veterinarians was particularly significant in the private practice income surveys.